Furukawa Hideo. Trans. Doug Slaymaker with Akiko Takenaka. Each issue of WLT features reviews of literature from all over the world. Read some of our reviews online or check out all of our reviews by subscribing or purchasing a single copy of the print or digital edition of our magazine. 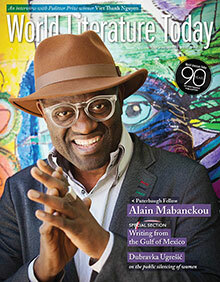 Featuring Pulitzer Prize winner Viet Thanh Nguyen, Puterbaugh Fellow Alain Mabanckou, and more.